The Rev. John R. Dowling was born May 16, 1950, in Savannah, Ga., the son of Joseph S. Dowling and Margaret Angela Ryan Dowling. He is serving his second assignment at Holy Ghost Church. One of seven children, he has a brother who is also a priest, Father Kevin Dowling. 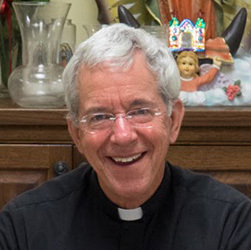 The future Father John Dowling attended Catholic elementary schools in Savannah and in Cincinnati before the family moved to Chattanooga in 1964. There he attended Notre Dame High School, graduating in 1968. He graduated from the University of Tennessee at Chattanooga with a bachelor of science degree in business administration in 1973. After college he worked for five years in the marketing and sales department of the Chattanooga Coca-Cola Bottling Co., doing price forecasting and acting as the firm’s convenience store representative. In 1978 he went to Borromeo Seminary in Cleveland, Ohio, for a year of pre-theology. From there he went to Mount St. Mary’s in Cincinnati. He was ordained a deacon April 3, 1982, by Archbishop Joseph Bernardin of Cincinnati at the Cathedral of St. Peter in Chains. He was ordained a priest June 17, 1983, by Nashville Bishop James D. Niedergeses at St. Jude Church in Chattanooga. 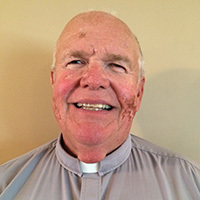 Father Dowling was briefly assigned as associate pastor of the Cathedral of the Incarnation in Nashville and on July 14, 1983, was named associate pastor of St. Jude in Chattanooga. He spent four years at St. Jude and on July 14, 1987, was named associate pastor of Holy Ghost and pastor of Holy Family in Seymour. During his years at St. Jude, Father Dowling taught at Notre Dame High School, and he later taught at Knoxville Catholic High School. While at Holy Ghost, he hosted a weekly radio program, “Let There Be Light,” on WITA-AM. His assignment at Holy Family ended Sept. 1, 1996, when he was named pastor of Christ the King in Tazewell, also remaining at Holy Ghost and KCHS during this time. Upon the death of longtime Holy Ghost pastor Father Albert Henkel in 1996, Father Dowling became parochial administrator of the parish. In 1997 Father Dowling became pastor of St. John Neumann in Farragut and was still leading the parish when it constructed a massive new Romanesque church from 2006 to 2008. On Feb. 1, 2010, Father Dowling became pastor of St. Francis of Assisi in Fairfield Glade, where he served until his return to Holy Ghost on July 1, 2014. Father Dowling has written booklets that include “Why Confess Your Sins to a Priest?” published by Liguori Publications in 1994. In 2005 Father John Dowling, Father Kevin Dowling, and Father Vann Johnston – now Bishop of Kansas City-Saint Joseph, Missouri – received national honors for saving a father and two of his children from plunging over a waterfall while the priests were on a hiking vacation in Montana. Father Michael Hendershott was born in Johnson City, Tennessee, and he grew up in Farragut with his five sisters and two brothers. St. John Neumann Catholic Church was his home parish. In the Fall of 2007, he entered the seminary for the Diocese of Knoxville. The then-Bishop Joseph E. Kurtz sent him to study philosophy at St. Charles Borromeo Seminary in Philadelphia, Pennsylvania. After four years of college seminary, he earned his Bachelor of Arts in Philosophy. Then Bishop Richard F. Stika sent him to Kenrick-Glennon Seminary in St. Louis for one year of theology and then to the Pontifical North American College in Rome, Italy for four more years of theology school. In June 2014, he completed a Bachelor of Sacred Theology (S.T.B.) and then in June 2016 he completed a Licentiate of Sacred Theology (S.T.L.) with a specialization in Dogmatic Theology. 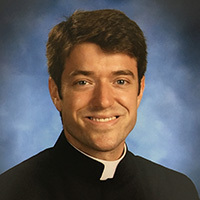 Father Michael Hendershott is assigned full-time to Knoxville Catholic High School as a Religion teacher, part-time as an associate at Holy Ghost Catholic Church, and part-time as an associate vocations director for the Diocese of Knoxville. He graduated from Rochester Institute of Technology with a Bachelor of Science Degree. He later went on to the University of Tennessee and received a Master of Science degree in Human Resource Development. Deacon Gordy and Fran have been married 47 years. They have two children and one grandchild. Deacon Gordy and Fran are coordinators for the Enthronement of the Sacred Heart of Jesus. Deacon Gordy is the spiritual director of the Legion of Mary both for the adults of Holy Ghost Church and the children at St. Joseph School. Deacon Gordy and Fran are also involved in RCIA, visiting newly weds, visiting recent widows/widowers. Deacon Gordy is currently leading the Hispanics in Exposition and Benediction of the Blessed Sacrament on the 4th Tuesday of each month. Deacon Gordy and Fran are so happy to be part of the spiritual family at Holy Ghost Church.